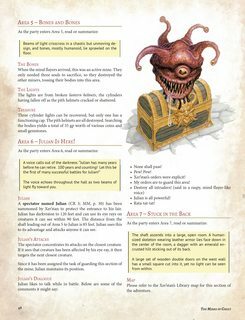 Presenting The Mines of Chult! This Savage Encounters adventure supplement features nine mini adventures from three best-selling DMs Guild authors. Featuring adventures for character levels 1 through 16, your PCs will challenge several new monsters, discover fascinating new magic items, and interact with some wickedly fun NPCs. Though designed with Tomb of Annihilation in mind, each of these adventures can be easily adapted to any campaign setting. With over sixty pages of thrilling 5th Edition D&D adventures ready to go, what are you waiting for? 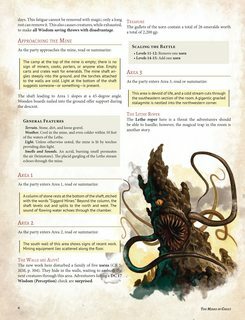 Dig in to The Mines of Chult! This is a PDF file of the adventure. If you are looking for the Fantasy Grounds VTT .mod file CLICK HERE. Check out DM Dango's YouTube review of The Mines of Chult by clicking here. 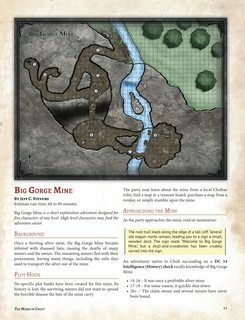 The Mines of Chult - A Savage Encounters Supplement. Want a few more areas to explore? Pick up my FREE Exploration Map pack! No luck on gridless colour maps? Not yet. The color maps were created specifically for the print-on-demand version. Multiple styles / versions of the color maps were not created. I’m still looking into this. I accidentally bough this version but I wanted to buy the Fantasy Grounds version :| Can you help with this problem? Refund or give me the FG version? Morten, Thank you for the purchase! At the bottom of this page there is a red Contact Us button. Send them an email and they should be able to correct this for you. Hello I noticed the PDF version seems to have updated color Maps. I was wondering if the Fantasy Grounds mod could be updated to include the updated maps and art etc..for Virtual Table Tops I definitely prefer more detailed maps if possible. The layout was redone so the product could be offered as Print On Demand. I'll have to speak to Rob to see if he can use the files I have to update the Fantasy Grounds version. I bought this thinking it was AL legal, I don't think it is, right? Sorry, it is not AL legal. any plans for a fantasy grounds version? The plans are in the works, but I don't have an estimated date yet. I've uploaded a version of the PDF that doesn't include hyperlinks in the text. Hopefully that corrects the issue. I've scanned both files with two different antivirus programs and I receive no warnings. My PC picked up a "Virus Detected" while downloading the main file. Hasn't happened with this group of authors before. Anyone else get this warning? One other person mentioned this. I've scanned the original PDF with two different AV programs and found no issues. I also contacted OBS and they seen no issues. It may have been a false positive. Same happened here. I will hope for an update soon to resolve this so I can use the product. Could I ask what antivirus software you are using? I know Windows Defender has notified a 'virus detected' for another customer. I'm using Symantec and I had no issues or warnings when I downloaded it. I think Defender is detecting a false positive. As I've mentioned, neither I nor OBS (DMs Guild) sees an issue with the file. I'm very sorry for this. This title was added to our catalog on March 15, 2018.